It seems that the MOBA (Multiplayer Online Battle Arena) genre may be warming up to consoles. 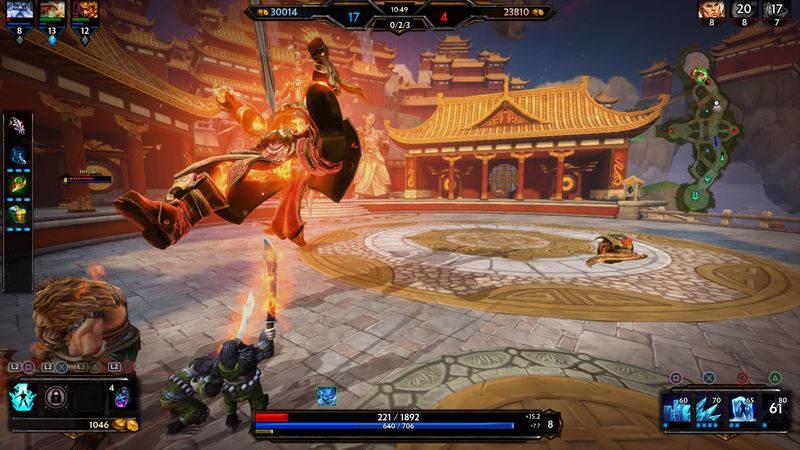 SMITE has been in beta for a while on the PlayStation 4 now, but the game is finally officially launching. We’ve put the game through its paces, and have our SMITE PS4 review ready to let you know if the genre adapts well to the home consoles. SMITE has actually been out since March 2014 on PC, with an Xbox One release in August 2015. The game isn’t terribly demanding, graphically speaking, due to the fact that the game runs on the Unreal Engine 3. Things run smoothly, with fairly high resolution textures, and no frame drops to speak of. Action quickly ramps up in any match, and the engine holds up just fine. There are a good handful of modes in SMITE, from the classic 5v5 Arena mode, to the serious Conquest mode. There’s a three-lane map, whereby your goal is to help your team break through the defenses of the opposing team, without allowing your own team’s defenses to fail. Matches can last upwards to half an hour, depending on how evenly teams are matched up. Until you’ve gathered up enough experience to unlock ranked matches, there is no guarantee of this. That is because there is no persistent lobby between matches, though there is a party system that allows a complete team of five players to stay together from match to match. Unless you have a solid team lined up, you can expect to lose a lot in SMITE. This is because if the opposing team has any coherence, they will win. Comebacks are not unheard of, and I’ve seen several Arena matches which ended with one team winning by only 4 of 500 tickets. So, while losses will come quite frequently to the single player, those in a group should have a lot of fun. On the other hand, the Joust mode provides for smaller, 3v3 combat, and later ranked matches do allow for 1v1 combat, so there is still a place for the lone wolf to tackle. SMITE is releasing using a free-to-play model. While you can purchase gems and unlock new characters permanently, earning the game’s non-premium currencies can also eventually unlock other characters, or alternatively allow you to “rent” the character for a given amount of time. If you don’t want to mess around with temporarily unlocking characters or grinding to unlock the next, then a $30 pack will permanently unlock all current and future characters. Though, it should be noted that the purchasing method appeared to be less than reliable when we used it — after purchasing any sort of premium pack, a logout was required in order for our account to properly reflect some unlocks having been made. Thankfully, SMITE does not appear to be a pay-to-win game. While some characters are very powerful, none of them are boosted because someone paid extra. All skills are available for each character from the start, though depending on which game mode you are playing they may not be available right away in a given match. The only thing paying gets you is the ability to use a certain character any time you want, or cosmetic changes. There is also a constantly rotating roster of temporarily free characters to choose from, ensuring that eventually you should be able to at least sample all of them. SMITE‘s claim to fame is that it features gods and other godlike beings from ancient mythologies spanning the breadth of human history. There’s characters from Greek, Roman, Hindu, Norse, Egyptian, and other ancient religions and/or geographical areas, each with their own distinctive look and fighting styles. There are some pretty badass interpretations of some of these characters, such as Hades, the Greek King of the Underworld, or Sobek, the Egyptian god of the Nile. Each character also boasts their own victory and defeat animations after a match has been decided, which is fun to see. With 76 characters, and more promised to be coming soon, there are plenty of fighters to master. One issue that MOBAs can face when being ported over to consoles is a complicated control scheme. While there are a few things to get used to, such as using R2 to fire your main, relatively weak attacks, generally the control scheme works very well in Smite. I was seeing multi-kills throughout my time in the game, even performing a few of my own from time to time. Tactics can be a little more challenging to divulge in-game, using a combination of the directional pad and face buttons to shout out a command, but if you’re in a dedicated party then you’ll likely be using a voice chat channel anyway. SMITE is well-balanced, and challenging. There are nearly 80 gods or godlike characters to choose from, each varied and styled after legends that have been around for much of human history. If anything, while there are a ton of characters to master, the number of maps is disappointing by comparison. As of this writing, there is only one map per game mode. While the maps are large, they are easy to memorize. While this may be by design, with the game built for the established eSports world, thus facilitating quick memorization of a map in order to capitalize on strategies, it still leaves you wanting for more. SMITE promotional code provided by publisher. For more information on scoring please see our Review Policy here.